On May 23 and May 24, Earth should plow through debris shed by Comet 209P/LINEAR, astronomers say. These extraterrestrial particles could give stargazers an incredible show as they burn up in the planet's atmosphere — or the anticipated fireworks may fizzle out. "Set your alarm clock for midnight on May 23 and 24, and keep your eyes peeled for slow-moving but bright meteors — both nights if you can," she said. The skies should be relatively dark on those days as well; the moon will be waning toward its new phase, which occurs May 28. Comet 209P/LINEAR — which was discovered in 2004 by the Lincoln Near-Earth Asteroid Research project (hence the name) — makes one trip around the sun every five years or so. The comet itself is relatively small and dim, but it may put on a special show thanks to orbital dynamics. The new meteor shower would be the second one to grace May's night sky. The first one, known as the Eta Aquarids, peaks overnight tonight (May 5-6). The Eta Aquarid meteor shower is generated by debris sloughed off by the famous Halley's Comet, which last cruised by Earth in 1986 and won't be back again until 2061. 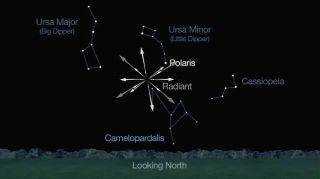 Observers with dark, clear skies might be able to spot up to 60 meteors during the shower's peak tonight, experts say. You can still see the meteors even if your views are marred by clouds or bright city lights. You can watch webcasts of the Eta Aquarid meteor shower Monday night here on Space.com, courtesy of NASA and the Slooh community telescope.